Tammy’s Italian heritage preened her for cooking the most amazing traditional meals. This one goes so well with our 2010 Cabernet Sauvignon that we thought it would be crime not to share it. Spinach Ravioli with Sicilian Sauce served with Arugula Salad and French bread. Cheesecake for dessert! Enjoy and let us know what you think. For the sauce… In a large saucepan, warm the olive oil at low heat. Add the garlic and onion, cook until golden, about 3 minutes. Pour in the tomato sauce and paste with 42 ounces of water, add basil and parsley bring the sauce to a boil. Reduce the heat to low and simmer 4 hours stirring consistently. For the pasta… Onto a clean surface create a well with flour. Scramble eggs and pour into the center of flour well along with a pinch of salt. Gradually stir the flour into the egg mixture until a rough ball forms. Knead dough until it is shiny and has a smooth texture. Adding additional flour if necessary. This could take several minutes. For the filling… In a medium saute pan, add 1 tablespoon olive oil and spinach. Season with salt and pepper. Cook until spinach is wilted. Transfer to colander and drain. Squeeze out all liquid. Transfer spinach to bowl, add ricotta. Mix well to combine. Set aside. 1. Place a large pot of salted water onto boil. 2. Roll out pasta using your pasta machine. Pasta sheet is thin without tearing. 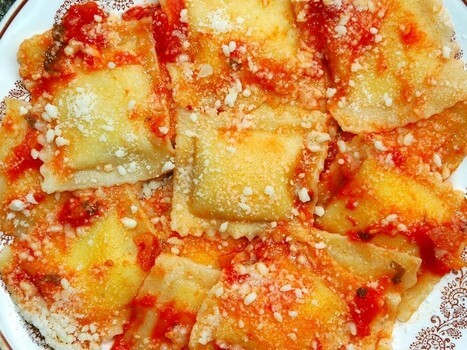 Place pasta sheet on ravioli tray. Using a teaspoon scoop out spinach mixture onto pasta sheets. Keeping a small bit of distance between each dollop. Carefully fold another pasta sheet on top. Use your rolling pin to seal the pasta sheets tightly together and remove any air. Continue until all ravioli are complete. 3. Place ravioli into boiling water and cook until al dente. Fresh pasta only takes a few minutes to cook. Transfer cooked ravioli into sauce pan and toss. Garnish with additional grated goat cheese. In another glass measuring cup, fill it with 1/3 cup warm water. Sprinkle the 1 Tablespoon of yeast over the water. With a fork, stir yeast into the water until yeast is completely dissolved. Pour the sugar, salt and shortening into the bowl of your stand mixer. Using a fork, mash these ingredients together. Pour the 1 cup of boiling water over the shortening mixture in the stand mixer. Add the 1 cup of cold water into the mixer. Then pour in the yeast/water mixture. Add 3 cups of flour into the mixer, and using the dough hook, turn mixer on low speed. With the mixer still on, slowly add in the remaining 3 cups of flour, 1 cup at a time. Once all 6 cups are in, turn speed to medium and let the dough mix for 6-8 minutes. The dough should be elastic. Be careful not to over-flour Once the dough is mixed, let it rest in the bowl for 5 minutes. Spray a bread pan with non-stick spray. After the dough has rested in the bowl, knead into a loaf and place in bread pan, sprinkle with garlic powder and cover with cloth to raise 4 -6 hours. Bake at 350 degrees F 15-20 minutes, or until the tops are golden brown and crisp. Remove the loaves from the bread pan and allow them to cool a bit before slicing. Spray with non-stick inside of a 10-inch springform pan. Bake for 2 hours, 15 minutes, 200 degrees or until the cake is very lightly colored and a knife inserted in the center emerges clean Refrigerate, covered, until well chilled. For best flavor and texture, this cheesecake is best chilled overnight.